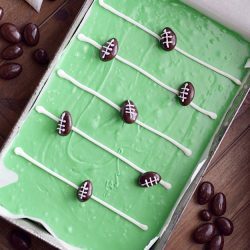 Easy to make delicious vanilla fudge that looks like a football field, with cute little chocolate covered almond footballs. 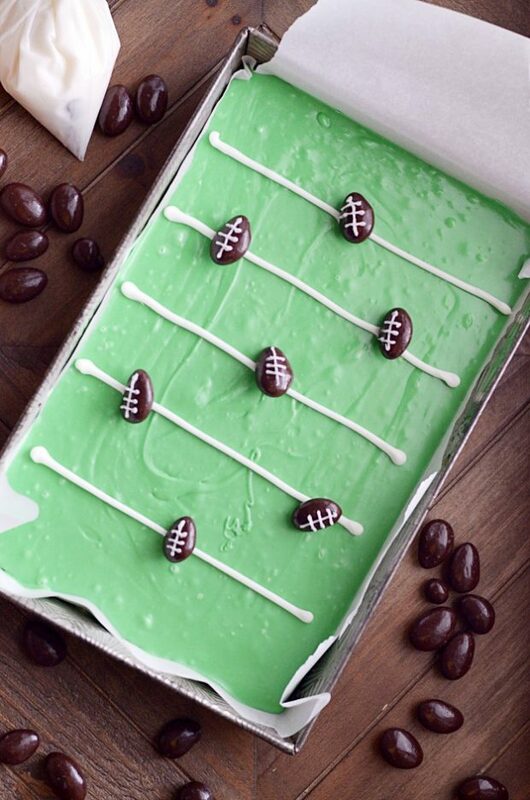 This is the perfect treat for football parties! 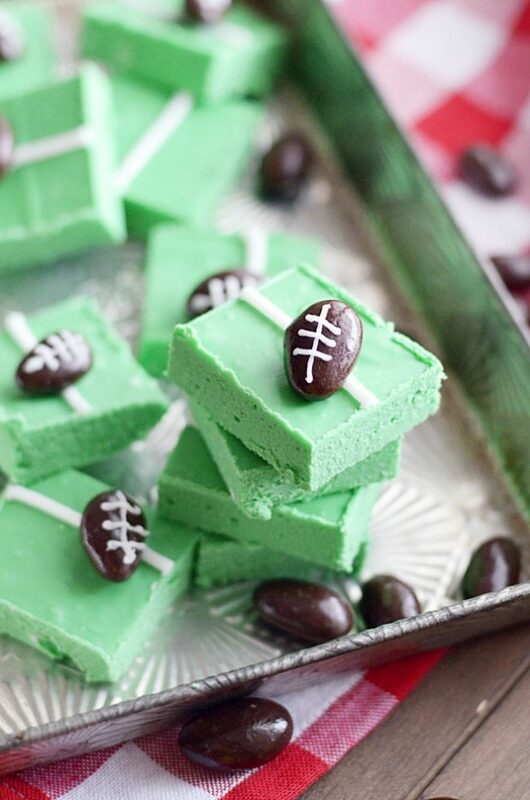 I don’t know why, but I just think football-themed treats are so cute. In fact, I think everything about football season is cute. I’m not saying I want to spend my Saturday watching every single game (as I’ve mentioned). But so much of it really is fun, even for someone like me who doesn’t really care about the game. I like “picking” a team, wearing fan gear, and even going to the occasional (half of a) game. And I like the excitement that energizes a room when everyone else is really enjoying a game. I know. Clearly, I’m dedicated. Who wouldn’t want me in their fan base?? ???? My daughter is cheering for the first time this season. And it’s ridiculously cute. Okay, so actually she had a total meltdown and cried on the sidelines the entire first game. That wasn’t so cute. But everything has been great ???????? since then. The apple didn’t fall far from the tree there, did it? As you might expect, I adore this fudge. I think it’s cute (SO CUTE) and perfect for a football party! You might not want to take it tailgating until the weather gets chilly, because you’ll have a melted mess on your hands. But for an indoor gathering, it’s perfect. ✓ There are two ways to make this fudge, and you can do whichever works best for you. 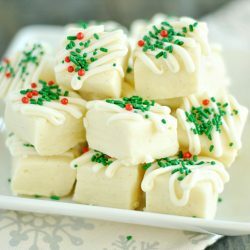 The first option is to make my favorite vanilla bean fudge recipe, but use green candy melts instead of white chocolate. This is the way I prefer to make it. -OR- you could use this recipe which calls for green frosting (Pillsbury makes a great shade) and white chips. This post is going to provide the recipe for my favorite vanilla fudge with green wafers, but just know that you have another option. ✓ Chocolate covered almond footballs are so easy to make, don’t be intimidated! I just put some vanilla frosting in a ziploc bag, snipped a teeny-tiny corner (like TEENY-TINY), and piped the frosting right onto the chocolate covered almonds. You could use white chocolate too (which would harden nicely), but I find that frosting is easier to control. ✓ Use a 9×9 baking dish, as I call for in the recipe. In the pictures, you can see I used a rectangular baking dish. But that’s because it’s a really odd-sized one that I just happened to pick up on eBay. It’s small enough to make this fudge (it’s NOT a 9×13 pan!). Please don’t try to use a bigger pan or your fudge will be too thin! Prepare a 9x9 baking dish by lining it with foil or parchment paper. Once smooth, pour the mixture into the lined baking dish. Let cool completely (you can speed set the fudge by placing it in the refrigerator for up to 20 minutes), 3-4 hours. Place the frosting in a small zipper bag and snip a small corner. Pipe lines onto the green fudge (like a field), and pipe stitches onto the almonds (like a football) before placing them on the fudge. Once cooled completely and set, cut into 1" squares for packaging and serving. 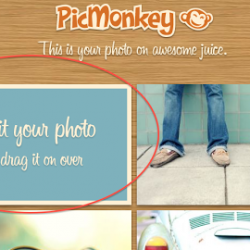 Not gonna lie…. 5 semester of ASL instead of a math class was one of the more brilliant things I’ve done in my life :) You should see if you can sub. a foreign language for your math credit! You are so brave to even try it without measuring. I still measure everything. Guess that is the CPA in me – I took a lot of math :) It looks yummy! I am so the same way, I do that with my icing, and it usually works. Then there are the times that you just want to pull your hair out because your stuff is just that little bit off. This looks like such a cute idea. This is so cute! What a great idea. Love the footballs too. Isn’t fudge with crust awesome??? Your football treats are amazing! I wish it was football season here in Australia! How have I not had fudge with crust before??? This looks so yummy–might have to make it for Sunday’s game! OH my heck! You are on a football roll here! And I love them all!!! Oh my friends would LOVE this if I brought it to the SB party! Fun, sweet and melt in your mouth delicious! 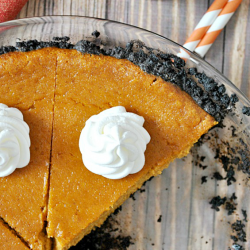 Love the cookie crust! oh my this is just too cute! Oh my this is awesome!!! I am going to share it on my Facebook page. Really cute. 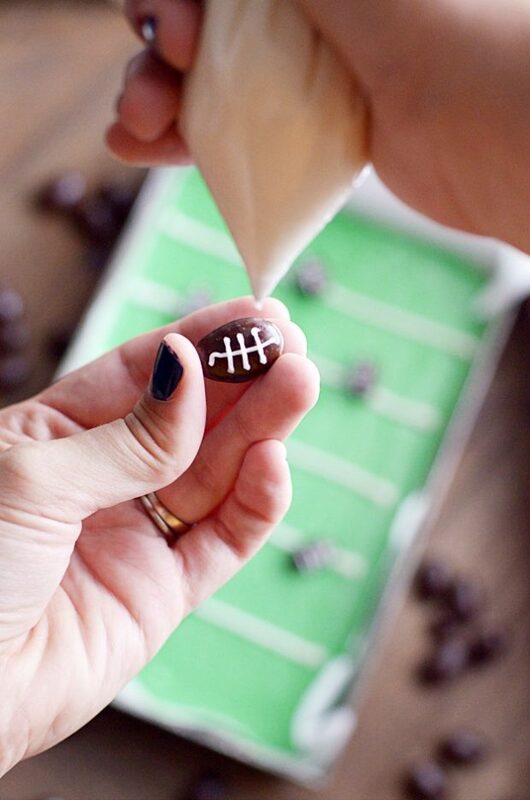 Seriously such a cute idea…love Dorothy’s crust in fudge idea:-) And the football…adorable!!!! I was looking for the perfect dessert for the kids on Superbowl Sunday and I just found it!! Thanks!